Buses are the most common form of public transportation for Israelis and travellers alike. There are several bus companies in Israel, but all routes and schedules are mandated by the ministry of transportation. The ministry issues tenders on bus routes, so that most bus routes typically change operator roughly every 10 years. The bus transport system has undergone changes since about 2000, as Egged and Dan were phased out of many of their former routes to be replaced by other companies. The quality of service of the new companies varies from very good to poor, not only between companies but also between regions of the same company. Egged  (pronounced "Egg-ed"), the largest company in Israel and the world's second largest bus company. It operates intercity and urban bus service in many parts of the country. Despite a reduction in its network in recent years, it still operates about 60% of bus service in Israel. Nazareth United Bus Services  and Nazareth Travel and Tourism both operate routes in Nazareth region. The most convenient and cheapest way to pay for bus and train rides in Israel is using the Rav-Kav card. If you're doing multiple rides a day or staying in the same area for over a week, you can also load daily, weekly and monthly passes on a Rav-Kav card. These passes are available in all parts of Israel, and are valid for all buses and trains in the chosen area. See Maps of daily, weekly and monthly pass zones. Personal: Includes the passenger's details and photo. This type is obligatory for some special fare cards, like the monthly pass, or for receiving a youth, student or senior citizen discount. A personal card is insured for loss or theft. The passenger's usage history will be recorded and saved for statistical purposes. Personal cards can be obtained at Rav-Kav service points. Fares are considerably lower than most Western European and North American countries. A single urban ride cost 5.90NIS in most metropolitans (2017), but could be as low as 3 NIS in smaller cities. Intercity fares don't follow a nationwide fare system, so you can find significant differences between journeys of similar length. The most expensive journey is between Haifa and Eilat, that cost 80NIS one way. Tickets can be bought from drivers on the bus or at ticket booths in terminals. Exact fare is not necessary, and drivers or cashiers would give change from notes up to 10 times of the fare (so you can use 50NIS note for in-city rides worth 5.90, 100NIS notes for fares over 10NIS, 200NIS notes for fares over 20NIS). Payment by credit card is accepted at ticket booths for fares over 22NIS. In general, journeys with connection require separate ticket for each segment. However, in many cities, including the metropolitans areas of Haifa, Jerusalem, Tel Aviv and Be'er Sheva, paying with a Rav-Kav card grants unlimited rides within 90 minutes. Reservation is available only for buses to/from Eilat, and can be done at a ticket booth, by phone or internet or text message. 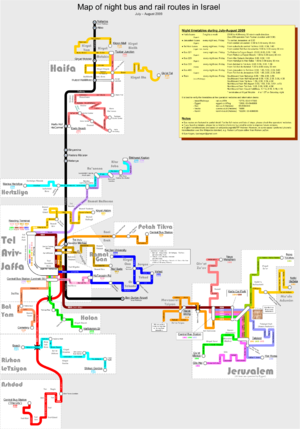 The official government website, Google Maps, Movit and several other websites and apps provide information about all buses and trains in Israel. Moovit, Efobus and some other apps provide real-time information on arrival times. In many central stations you can find electronic information boards, which provide info on destinations, platforms and times of departures within the next hour. These boards are arranged by Hebrew alphabet, and in big terminals it might take a few minutes until you get the info you need. Information booths are operated by several companies in some terminals. Bus stops in cities and on the roads are marked by a yellow metal "flag". The list of route no. that stop there are marked on the flag, generally accompanied by the destinations. If you see it in Hebrew only, check the other side and you might find the English version there. (Sometimes, though, the English version is incomplete.) You may also find route maps posted on the wall of the stop shed. If you need help reading this info or just clueless, don't be shy to ask other passengers. Ministry of Transportation (Call-Kav): Dial *8787 or send an SMS message (Hebrew) to 8787. Call center hours: Weekdays 7.00-23.00, Friday 8.00-15.00, Saturday 30 minutes after end of Shabat to 23.00. Egged: Dial *2800 from any phone, or send an SMS message (Hebrew) to *2800. Call center hours: Weekdays 7.00-23.00, Friday 7.30-15.00, Saturday from end of Shabbat to 23.00. There is service in English, Hebrew and Russian. Dan: Dial 03-6394444 (Bezek), *3456 (Cellcom/Orange) or *4444 (Pelephone). Call center hours: Weekdays 7.00-21.00, Friday 7.00-13.00, Saturday 18.00-22.00. Computer service available 24/7. Languages: Hebrew, English, Russian and Spanish. Kavim: Dial *2060. Languages: Hebrew, Russian. Online info: 050-5006070 (Gush Dan only). Metropoline: Dial *5900 from any phone, 24 hours a day (except on Shabbat). Initial response is in Hebrew only, but dial 7 for service by agent and you'll be served in English and possibly other languages. Connex: Dial *6686 from any phone, 24 hours a day (except on Shabbat). Initial response is in Hebrew only, but dial *7 for service by agent and you'll be served in English and possibly other languages. Online info: 054-6600088 (service in Hebrew and Russian only). Metrodan: Dial *5100 from any phone, 24 hours a day (except on Shabbat). Initial response is in Hebrew only, but dial 7 for service by agent and you'll be served in English and possibly other languages. Nateev Express: Dial 1599559559. Same number also for Nazareth Travel and Tourism and Nazareth United Bus Services. Superbus: Dial 08-9205005. Call center hours: Weekdays 7.00-22.00, Friday 8.00-14.00, Saturday 19.30-22.00. Illit: Dial 02-5807777. Call center hours: Weekdays 7.00-22.00, Friday 8.00-15.00, Saturday 21.30-23.30. There is night bus service in several areas, including Tel Aviv and Jerusalem. Night buses are operated by the regular bus operators, but have distinct numbers and routes. The official night bus website  contains information in Hebrew. Night buse schedules can be found on all the websites and apps that show daytime buses. Most intercity lines originate or end in a central bus station (CBS) or terminal ("takhana merkazit"). Many central bus stations were built after 1990 and combine a bus terminal and a shopping center in one building. CBS of this type include those of Tel Aviv, Jerusalem, Haifa (Hof HaCarmel), Be'er Sheva, and others. Due to the relatively short bus journeys, there are no toilets on buses in Israel, and no "frills" at all. If you are desperate for a bathroom break you can ask the driver and he might let you go at the side of the road (particularly when the next stop is a long way away). It's best advised to check in advance for stops along the route, and/or empty prior to taking the bus. Long-distance routes, such as Tel Aviv to Tiberias or Kiryat Shmona in the Galilee, make a stop of up to 10 minutes at designated places. There are two stops on routes to Eilat. The driver will often have the radio playing, even late at night. Many drivers object to cell phone conversations being held immediately behind their seats. If you want to have the heat or air conditioning adjusted, or have the radio adjusted - well, Israel is not a shy society. Of course, this goes both ways. Haredi, or mehadrin routes serve centers of Israel's ultraorthodox (haredi) population, a portion of which have strict rules limiting contact between men and women. Anyone can take these routes. You will see the other passengers observing certain rules of conduct: usually men sit in the front half of the bus and women sit in the back half, and go in and out through the back door. It is forbidden to pester a passenger about the seat they chose; however, polite and less polite requests to sit according to your gender are common. A court case ruled that the seating arrangements must be entirely voluntary. Advantages of routes for the ultraorthodox population are that they go to each city's main religious neighborhoods, not just the central bus station. This often saves a local bus ride at the end on trip, especially useful very late at night when local buses have stopped running. Also, they are cheaper than regular buses. Some of them run infrequently, so check the schedule first. However, they often run at times other buses do not, especially late at night. Routes for the ultraorthodox population can usually be identified by their endpoints: Har Chotzvim/Atirot Mada in Jerusalem, and Bnei Brak in the Tel Aviv area, rather than the normal central bus stations. Without being unduly alarmist, intra-city buses and bus stops have unfortunately been the targets of suicide bombers in the 1990s and early 2000s. If you see anyone acting suspiciously, or discover an unattended parcel, notify the driver, a soldier or police officer immediately. If you can, avoid standing in large crowds of people in order to further minimise any risk. For the last few years, however, the number of suicide attacks on buses has steadily declined, and the last suicide attack on a bus was 2 years ago. If you're waiting at a bus stop with multiple routes, stick out a hand/finger (also the Israeli hitchhiking sign) to flag down the driver as the bus approaches. If he or she doesn't realize you're waiting for that particular bus, you may get passed by completely. Do not wave, some drivers think that means you DON'T want that particular bus. If there's a large crowd to get on the bus, don't be afraid to assert yourself firmly (but not impolitely) when people try to push ahead of you. If you want the driver to tell you your stop, it is best to be clear about it. If you just tell the driver where you want to go, he may ask you at the following stop why you didn't get off. Also, he might forget, so it is often better to ask the passengers. While Israeli manners may be rougher than in some other countries, they are also more likely to actually help you, with several people debating the best route for you. This page was last edited on 9 August 2018, at 13:46.